Though born in London, England, Vaiyasaki Das came of age in Winnipeg, Canada. 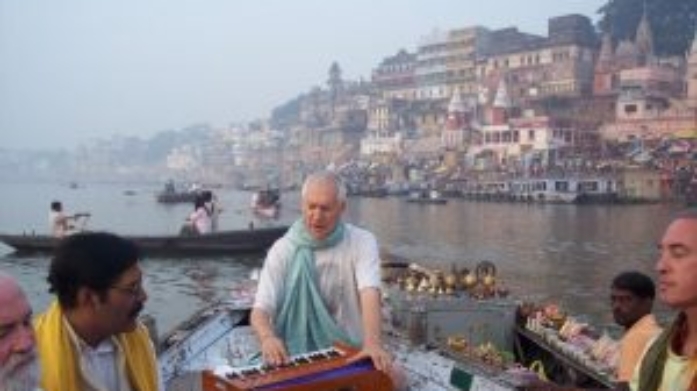 After many years in the music business – and a personal search for the divine — he is now one of the premier singers on the kirtan circuit. Starting out as a rock and blues guitarist with a penchant for singing, his taste for Indian culture came at an early age. His first album was released in 1982 followed by numerous CDs, which are now considered seminal in the yoga/kirtan/world music universe. Vaiyasaki Das’s CDs include: The Way of Love, Charana Kamal, Kirtan Rasa, Hari-Nam-Ananda, Transcendence, Vrindavan Chandra, Chaitanya Chandra, Ratha-Yatra USA, The Turning Point, Best of Vaiyasaki, Sri Krishna Divya Nam -the beautiful divine name, & Kirtan Explosion -high energy kirtans.